The representatives of the first congress (The 24th Annual Meeting of the RNA Society), planned for 2019, were coming to Krakow to learn about the city's potential in terms of hotel and catering facilities as well as the potential of the accompanying program for the participants. The contract for the event was signed earlier, so the goal was to present the atmosphere of the capital of Małopolska in the best way possible. Representatives of the second congress first needed to be enchanted with the city and had to be presented with the local offer of the local MICE industry. Krakow was one of several possible destinations for an event planned for 2020 (the contract is still being negotiated). The examples of these visits are not accidental - the Krakow Network members helped in their preparation. How did the existence of such a network in the city translate into efficiency of action? “As hosts, we showed an instant reaction, a great understanding of the needs of the organizers and we proved that Polish hospitality is still doing great” - says Weronika Wirtel from the ICE Kraków sales team. In practice, it looked like this: a message with information about the planned visits was sent out by the ICE Kraków team (whom the organizers first contacted) to the group members. Declarations of help in the preparation of the site inspection came from the Krakow Convention Bureau website, representatives of local hotels, restaurants and also DMC companies. The next step was to set up a framework for each visit. Thanks to the cooperation between representatives of various sectors of the MICE industry, participants could count on among others, free accommodations and tastings, but first of all they visited the city and got to know its MICE offer. - It was a greatly organized visit, we found out everything we needed to know. Meeting with the ICE Krakow team and Krakow Network members has been a real pleasure. Mary McCann from the US company, Simple Meetings, and who was responsible for the implementation of the RNA congress says, “I have a feeling that the congress of our association in Krakow will be one of the best organized events over the last 20 years”. All Krakow entities that took part in these projects had the opportunity to advertise their services and present them from the practical side. - Traditional Polish hospitality in its modern edition seems to be the key to attract congresses, conferences or business events. Izabela Helbin, director of the Krakow Festival Office says, “Perhaps thanks to this, Krakow will consolidate its new image of a dynamic and modern city, which on a daily basis does not forget the power of its historical heritage. Time will show, but everything indicates that this is how it is going to be”. According to the representatives of the Krakow MICE industry, thanks to the Krakow Network initiative, the entire city has entered a completely different league of the host cities of congresses. The main idea behind the creation of this project was to create a strong business group from various sectors of the tourism industry, whose activities will affect the number of events to take place in Krakow. The nature of its activity is also reflected in the analysis of developmental directions, effectiveness of activities and monitoring of the economic impact the meetings industry has on the economic situation in Kraków and Małopolska. The originator of the initiative was the Krakow Festival Office, which is the operator of ICE Kraków. At the end of 2014, about 30 entities were invited to participate in the project. 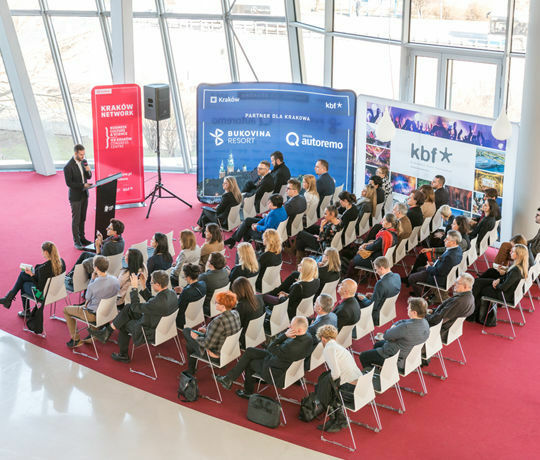 Today (as of November of this year), there are nearly 400 people in the data base, representing almost 200 entities, which belong to six thematic groups - Hotelier, Gastronomy, PR, Kraków Future Lab, Krakow Club of Congress Ambassadors and the Event Group established in October. It is obvious that the entities who interact with each other in the same market and fight for the same events every day, at the very beginning approached this concept with a certain distance from one another. It is not in their general nature to share information and play their cards openly. “It took us 2.5 years to work out the standards by which we work today. It was worth investing this time in work on the direction of Kraków Network, because it is a combination of expectations of meeting participants, customer needs and the opportunities of our market” explains Izabela Helbin. Krakow Network meetings are also a platform for exchanging experiences, knowledge and good practices between its participants. They are systematically held once every quarter. In addition, each of the thematic groups is discussed in smaller groups, which also meet at least once every three months. There are also free trainings and workshops (including storytelling with Aleksandra Więcka or public speeches with Michał Zalewski from the PR Group). Other benefits include building a network of contacts, access to the calendar of events planned in Krakow or the opportunity to learn the latest trends in marketing and development of digital technologies (one of the meetings of the Krakow Future Lab group was devoted to the development of artificial intelligence in the meetings industry, others concerned the organizers responsibility for environmental events and pro-ecological activities during congresses and conferences). However, most important is the trust that the participants began to give towards one another. Members of the Hotel Group, knowing the schedule of planned events are able to plan for activities in advance. When trying to organize events for Krakow, PCO, DMC or the entities themselves, they can be sure that they will be able to provide guests with the right number of beds at a given time. This knowledge is also used by the members of the Gastronomy Group who can submit offers for catering services for the upcoming congresses. In turn, the Krakow Club of Congress Ambassadors started a project to present the possibilities of Krakow in terms of organizing conferences for the academic environment. Together with Paula Fanderowska, who is deputy head of the KBF for ICE Kraków and Małgorzata Przygórska-Skowron, manager of the Krakow Convention Bureau, we have already had many meetings with professors from various Krakow universities, and we have presented Krakow's offer during meetings of faculty councils at the Jagiellonian University. “Awareness that we have professionals and are able to cooperate in the meeting industry in Krakow, gives us really great confidence regarding our work”- assures Anna Jędrocha, president of the board of Symposium Cracoviense and the Association Conferences and Congresses in Poland (SKKP). The effect of cooperation between SKKP, the Polish Tourist Organization, the Krakow Convention Bureau, ICE Kraków and members of the Krakow Network, among others, resulted in the organization last year in Krakow of the Gala of Polish Congress Ambassadors. Interestingly, it was the people involved in the operation of the Krakow network who brought to the organization of this event several innovations that were developed during this year's Gala in Poznań. This refers to the new category of the Patron of Polish Congresses (Mecenasa Kongresów Polskich). The local academic community which took part in the event and during the congresses works with service providers and facilities, repeatedly emphasized that the support provided by both the City of Krakow and specialists in various fields is very helpful during the planning of the events. Similar prospects also come from other potential customers coming from both Poland and abroad. In conversations with such persons during the IMEX and IBTM World fairs, words such as "open-minded", "unexpected hospitality" and "surprising cooperation on a global scale" were often heard. Małgorzata Przygórska-Skowron, who manages the Krakow Convention Bureau, emphasizes that she has repeatedly presented the possibilities of support that Krakow can offer to the organizers of events. The DMC and PCO companies also participated in this type of meetings (realized under the Kraków Network). “I am sure that as market participants we all speak with one voice and we well-know what we are able to offer. Our task is to combine individual entities working on the implementation of events, as well as the task of presenting the city's offer during foreign events” - says Małgorzata Przygórska-Skowron. Of course, not everything has yet been accomplished. There is still much work to be done. The members of the Krakow Network still need to discuss among others, the transparent participation rules of event agencies and AV suppliers in tenders, the setting up of a recommendation system for Krakow's caterers and restaurants and the development of a coherent visual communication system.